We received cat and dog food from Against the Grain Pet Food to try out. We have fur babies that we love, they are a part of our family. It is important to us that we take good care of our animals and that they eat healthy. 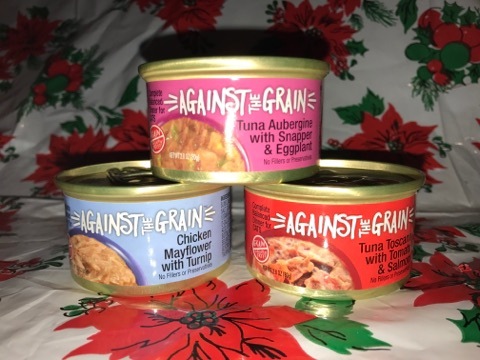 We received some cat and dog food from Against the Grain . Our dog and cats loved these foods. We love that these foods seem to be made with a lot of care for our animals best nutritional needs. Many cat foods use an abundance of grain as fillers in their food. This isn't healthy and cats could get fatally ill. Many of these kinds of cat foods are cheaper and our pets are not getting the proper nutrients. Many pets will gain too much weight from over eating. If your cat has specific issues, you can pick the one that deals with that particular issue. I was sent several for our cats. When you first open the tubs you will smell meat. The tubs are filled with meat shredded in gravy. Our cats absolutely loved every bite. Against the Grain Super Food can help fight parasites, crystals in urine and fungus and increase prostate, kidney, bladder and pancreas health in addition to giving your feline’s immune system a boost. Fish-based varieties are dolphin and turtle safe if you’re concerned about the environment, too. 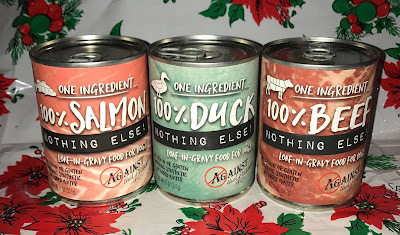 We received some 100% Beef, Duck and Salmon from Against The Grain. This dog food has one ingredient and that is the Meat. It's grain and gluten free. There are no Gums, corn, wheat or soy in this dog food. 100% Beef from Against The Grain is 100% Paleo with no added water.The ingredients in this can are limited making it great for pets on a special diet. This pet food was made right here in the United States. The White meat Chicken and Polyhaui’I Berries are hand packed, it's a hand-selected blend of unique protein and superfood to serve your cat the most healthy and palatable complete and balanced dinner. Against the Grain is a family-owned and operated company. They truly consider their pets as a part of their family. They would do anything to ensure the life, health, and happiness of their family, and therefore they have created a pet food that is of the quality their pets need.After realizing that 99% of pet foods in the market are all of the same type, which is: an inferior manufacturing process, non-unique ingredients, and designed to be cost-effective where pet nutrition is not the number one priority. So Against The Grain was created. They make food that is second to none, and completely unique, revolutionary, evolutionary, nutritious, and wholesome. They first came up with what would be required to make the BEST bio-available pet food available, then developed the manufacturing to make the best pet food cost-effective. We would recommend this cat and dog food to all you animal lovers. For the health and well being of your animals these foods are wonderful. Great blog post, this food looks great for animals. my dog will love having it. He often have some issues with his food, so i guess Against The Grain will prove good for Tim , my dog. I never realized that grains for animals didn't give them the same benefits that grains do for humans. Definitely food for thought. Chicken & Polyhauai’i Berry Dinner sounds great, My fur babies would love this for sure. I need to have this for my pets. I would get all of the varieties. Such an informative post here, I would definitely feed this to my cat, I didn't know that information about the grains! I am always on the search for great food for my dog, especially now that she is getting older. Nutrition and price are super important for our family. Against the Grain looks like a great option! My fur baby would love this tasty food. I had no idea canned food contained grains, since I usually feed my dog dry food. It's so odd all of the gross filers placed in our pets food that doesn't need to be there. Glad to see more brands doing something about this issue. I will recommend it to my parents who own cats. Sounds like a good quality per food. Will have to check it out for our kitty! Great information! I had no idea that animals didn't benefit from grains the way we do. I have not seen this in the stores near me yet. I would love to give her grain free food but she won't touch anything with veggies in it--I would be willing to try it out if I see it and she if she happens to like it! I love alternative foods compared to the big corporate foods. I need to try these for my animals some time! It is nice to know that healthier and tastier food is out there for our pets. They need great food too. I like that it's 85% meat. I think it's important to keep that protein level high for the pets. Oh wow! Great new food for my fur baby! I love it! I will have to pick some up soon. I just have to be careful to give him just he right amount. My dog is a big eater and I don't want him to be overweight.